I didn't see an eggplant until I was in my 20s; yes, I led a sheltered life as far as foods from other cultures went. In my defence so did most Australians back then. The first time I ate eggplant was in the classic French vegetable dish, ratatouille, and quite honestly, it could have been anything as the flavour was overwhelmed by the tomatoes and herbs. I've come to love the taste, particularly when it is the star of the show as is the case with baba ganoush, that smoky Middle Eastern dip. A friend coats thin slices in flour, egg and panko breadcrumbs to create a schnitzel to please her many vegetarian friends. Eggplant lends itself well to stuffing and baking; I use a simple mixture of tomato, onion, capsicum, olives and herbs, but use your imagination. Throw in some chopped mushrooms if you have some; preserved artichoke hearts wouldn't go astray either. I don't bother with salting eggplant flesh any more; the modern variety don't seem to have the "indigestible juices” all my old cookbooks used to mention. Preheat oven to 200C. Cut eggplants in half lengthwise and scoop out flesh, leaving a 2cm shell. Heat oil in a frying pan over medium heat and add onion; cook until transparent. Add garlic, capsicum and diced eggplant flesh and cook for five minutes, stirring occasionally. Add tomatoes, olives, parsley, thyme leaves and salt and pepper. Cook for a further five minutes. 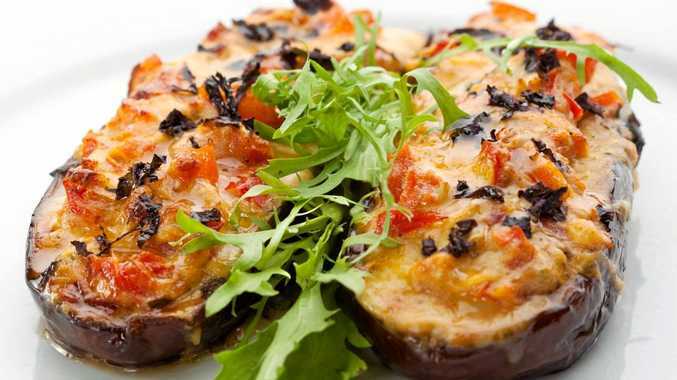 Place eggplant halves on an oven tray lined with baking paper and fill with mixture. Top with grated cheese and bake at 400C for 25-30 minutes.